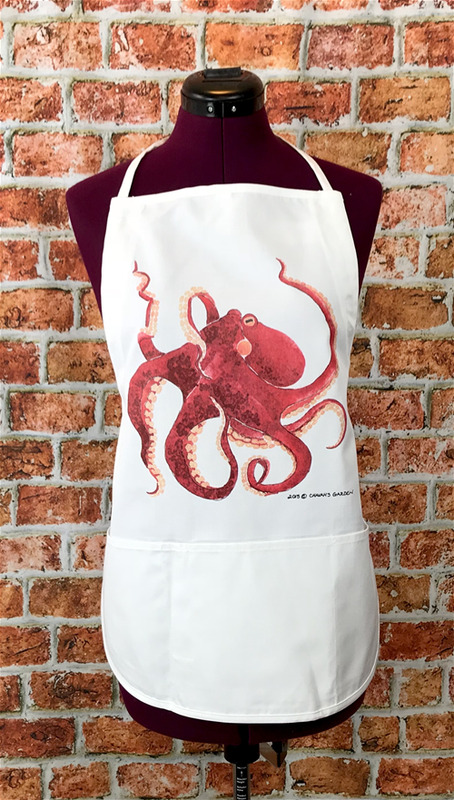 Practical Kitchen Art: Deluxe flour sack tea towels, kitchen art prints, and aprons locally (in Seattle) printed with Syd's bright watercolor designs. Practical kitchen art means not only beautiful products, but that the towels and aprons can take the rough and tumble of kitchen life, plus the washer and dryer, and still shine. 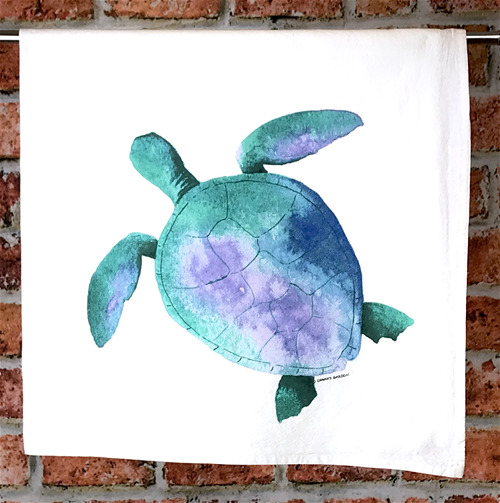 My watercolor painting of a sea turtle, with colors like it's swimming through tropical waters, locally screen printed onto a crisp 100% cotton flour sack dish towel. On the oven handle, it folds into a generous square (14 in/33 cm). -- My screen printer uses a very soft ink so the design does not feel heavy or waxy, and it will soften up even more as your customers wash and use it. -- My towels are washer/dryer friendly (just no bleach and no fabric softener). Rugged, as anything for the kitchen should be. -- Flour sack tea towels have a superpower: they dry dishes without streaks or lint, and can keep drying even when they're wet. This combination of superpowers makes for the ultimate in easy-to-care-for kitchen luxury. Packaged with a belly band. Can be folded in a basket or hung (hangers available). Freebies upon request: a fun sheet with images of the many ways tea towels can be used (e.g. wrapping paper, tea cozies, etc) plus two pages showing how to wrap a wine bottle and a large book using Chavah's Garden tea towels as wrapping paper. 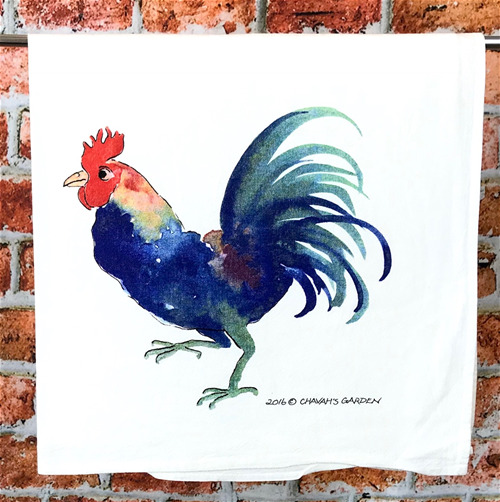 My watercolor painting of a rooster, locally screen printed onto an crisp 100% cotton flour sack dish towel. On the oven handle, it folds into a generous square (13 in/33 cm) of roosterness. 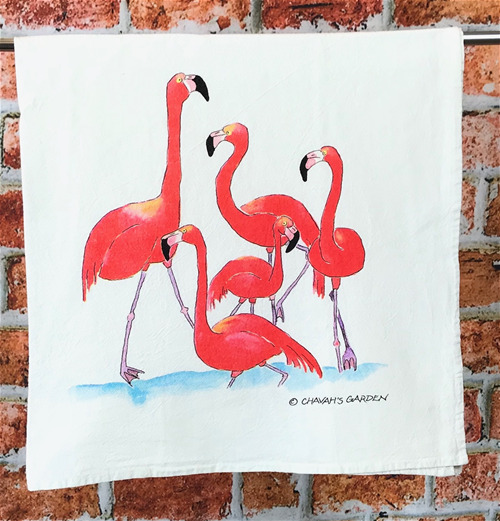 Dimensions: 26" x 26" x 1"
My watercolor painting of flamingos, locally screen printed onto an crisp 100% cotton flour sack dish towel. On the oven handle, it folds into a generous square (14 in/33 cm). Freebies upon request: a fun sheet with images of the many ways tea towels can be used (e.g. wrapping paper, tea cozies, etc) plus two pages showing how to wrap a wine bottle gift and a large book using Chavah's Garden tea towels as wrapping paper. 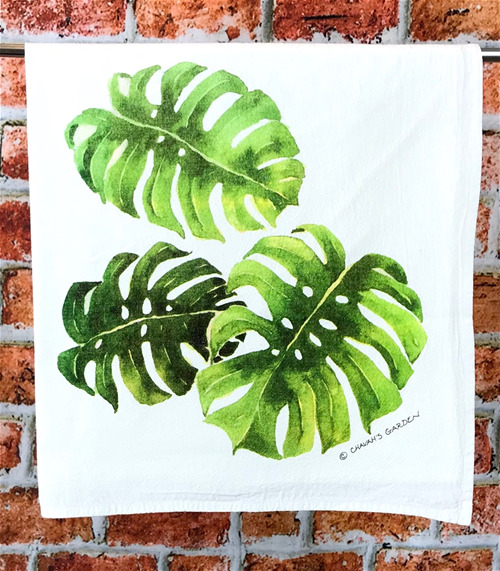 My watercolor painting of monstera leaves, locally screen printed onto an crisp 100% cotton flour sack dish towel. On the oven handle, it folds into a generous square (14 in/33 cm). 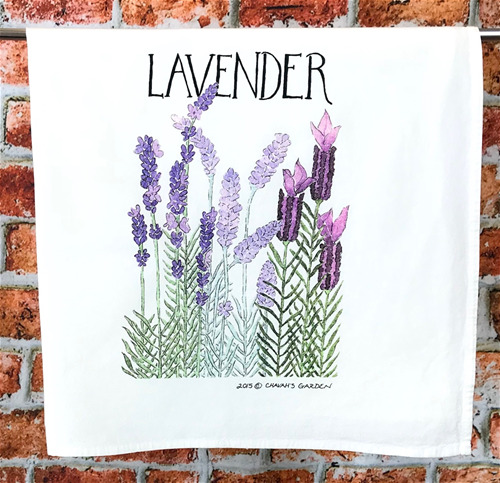 My watercolor painting of three kinds of lavender, locally screen printed onto an crisp 100% cotton flour sack dish towel. On the oven handle, it folds into a generous square (14 in/33 cm). My aprons are a cotton and polyester blend that is both light weight and sturdy. --- handy: they have three pockets for keeping your cell phone or anything else nearby while cooking, gardening, cleaning, creating or any activity.